As enterprises move their applications, services and data to the cloud, it’s critical that they put appropriate access controls in place to help ensure that the right people can access the right data at the right time. That’s why we’re excited to announce the beta release of custom roles for Cloud IAM. 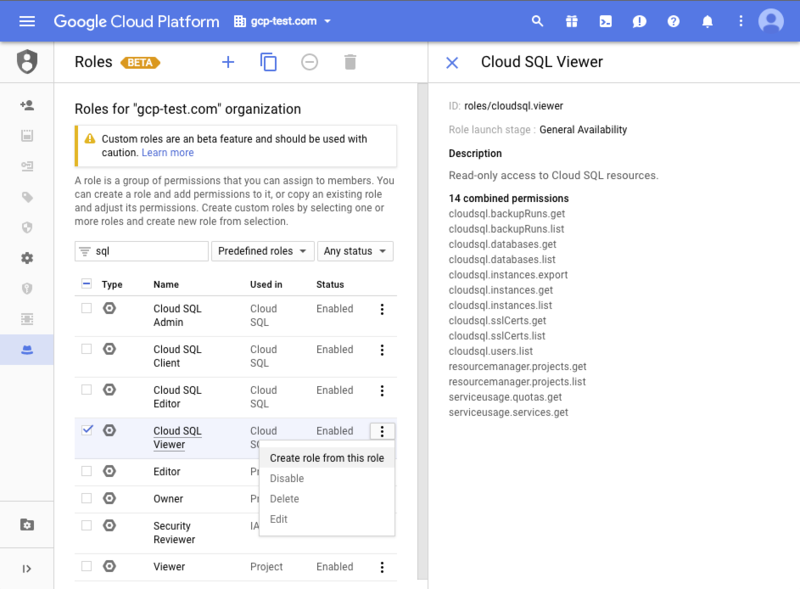 IAM offers three primitive roles for Owner, Editor, and Viewer that make it easy to get started, and over one hundred service-specific predefined roles that combine a curated set of permissions necessary to complete different tasks across GCP. In many cases, predefined roles are sufficient for controlling access to GCP services. For example, the Cloud SQL Viewer predefined role combines 14 permissions necessary to allow users to browse and export databases. Custom roles complement the primitive and predefined roles when you need to be even more precise. For example, an auditor may only need to access a database to gather audit findings so they know what data is being collected, but not to read the actual data or perform any other operations. You can build your own “Cloud SQL Inventory” custom role to grant auditors browse access to databases without giving them permission to export their contents. Step 2: Clone the predefined role and give it a custom name and ID. Add or remove the desired permissions for your new custom role. In this case, that’s removing cloudsql.instances.export. Custom roles are available now in the Cloud Console, on the Roles tab under the ‘IAM & admin’ menu; as a REST API; and on the command line as gcloud beta iam. As you create a custom role, you can also assign it a lifecycle stage to inform your users about the readiness of the role for production usage. IAM supports custom roles for projects and across entire organizations to centralize development, testing, maintenance, and sharing of roles. 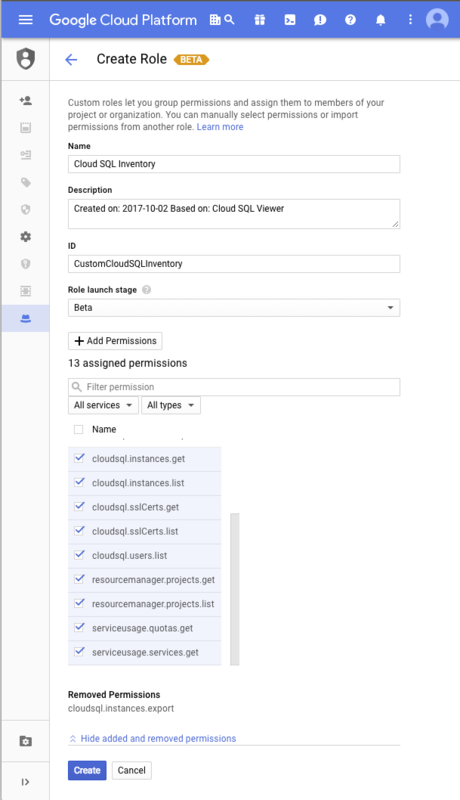 When using custom roles, it’s important to track what permissions are associated with the roles you create, since available permissions for GCP services evolve and change over time. Unlike GCP predefined roles, you control if and when permissions are added or removed. Returning to our example, if new features are added to the Cloud SQL service — with corresponding new permissions — then you decide whether to add the new permissions to your customized “SQL Inventory” role as you see fit. During your testing, the Cloud Console’s appearance may vary for users who are granted custom roles, since UI elements may be enabled or disabled by specific permissions. To help maintain your custom roles, you can refer to the new IAM permissions change log to find all changes to beta and GA services’ permissions. Interested in customizing Cloud IAM roles in your GCP project? Check out the detailed step-by-step instructions on how to get started here. We hope Cloud IAM custom roles make it easier for organizations to align access controls to their business processes. In conjunction with resource-level IAM policies, which can control access down to specific resources such as Pub/Sub topics or Machine Learning models, security administrators now have the power to publish policies as precise as granting a single user just one permission on a resource — or on whole folders full of projects. We welcome your feedback.